Seeking his first win on the All Thailand Golf Tour, the 23-year-old from Surat Thani, who notched up eight birdies, four in each half at the par-72 Singha Park Khon Kaen Golf Club, stayed two shots ahead of 2017 champion Danthai Boonma and Piya Swangarunporn. Chaiphat Koonmark and Chonlatit Chuenboonngam were on 5-under each. “Everything clicks for me today,” said the 23-year-old Poom from Surat Thani. The winner will take home 450,000 baht from the 3-million baht tournament ,which serves as the second leg of the All Thailand Golf Tour 2019, and also seven world ranking points. Danthai became satisfied with his performance of seven birdies and one bogey at par-72, and 7,352-yard course. “The course condition is really great with fast greens. It is not windy and so I can have good approach shots, giving myself lots of birdie chances,” he said. Asked about his chance to win here, Danthai said that it depends on how good his putting would be. 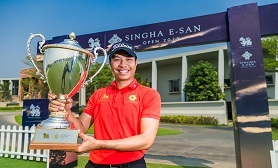 In 2017, the Sukhothai native got the opening round 68 and won the title by seven shots on 22-under. Prayad Marksaeng, eying his third title here, stayed four shots off the pace following his 68 while qualifier Nitithorn Thippong, Poom Saksansin and Thanyakorn Khrongpha were each one shot down further. Chapchai Nirat, Natipong Srithong, Pawin Ingkhapradit, Thitiphun Chuayprakong and Kosuke Hamamoto each made a 70 to stay tied for 21st. Defending champion Rattanon Wannasrichan got two birdies and four bogeys for a 74.